Calibration is accurate and fast with the new compact-sized Beamex® MC4 Documenting Process Calibrator. The Beamex® MC4 is a new compact-sized documenting process calibrator. Being a multifunction calibrator, the MC4 is suitable for calibrating various process parameters, such as pressure, temperature and electrical signals. As the MC4 is a documenting calibrator, calibration results are automatically stored in the MC4’s memory. In addition, instrument data can be sent from computer to MC4 and calibration results can be uploaded from the MC4 to a computer using Beamex® CMX Calibration Software. With the MC4, making automated and documented calibrations of process instruments is fast and easy. Using the MC4 together with calibration software provides a complete documenting calibration system that produces calibration certificates automatically. There’s no need for using pen and paper for producing calibration documentation and instructions at any point of the calibration process. Due to its documenting capability, the MC4 can help reduce costs, time and effort, while also ensuring calibration results are accurate and consistent. High accuracy is one of the important features of the MC4. An accredited calibration certificate is included as standard with MC4 as a proof of the accuracy. The correction coefficients of a PRT probe can be programmed to MC4 to further improve the temperature accuracy. Large graphical display, menu-based multilingual user interface and full numerical keyboard make it easy to learn and use the MC4. A rechargeable internal battery pack and charger are standard accessories supporting the effective use of the MC4. Membrane keyboard and integrated impact protectors make the MC4 a weatherproof and robust calibrator. MC4 can have both internal and external pressure modules, making it really versatile. 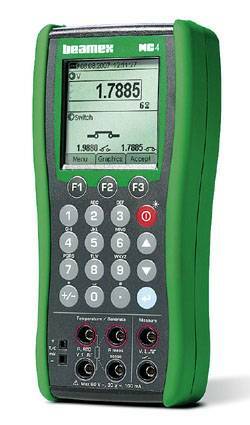 “The MC4 is an easy-to-use, attractively priced high-quality documenting calibrator. It’s a great entry-level documenting calibrator for engineers and technicians, who have been mainly using single-function or multiple-function non-documenting calibrators”, Heikki Laurila, Beamex’s Product Manager, explains the benefits of the new product. BEAMEX is a leading, worldwide provider of calibration solutions that meet even the most demanding requirements of process instrumentation. Beamex offers a comprehensive range of products and services – from portable calibrators to workstations, calibration accessories, calibration software, industry-specific solutions and professional services. Through Beamex’s partner network, their products and services are available in more than 60 countries. Beamex has more than 10,000 customers worldwide.